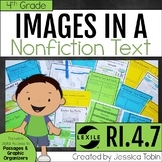 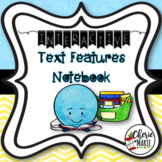 Assessment on text features; students must fill in a box with either the text feature name, picture/example, description, what it tells you, or why the author chose the particular text feature. 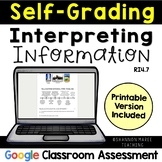 Answer Key included. 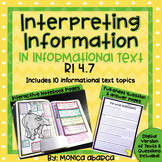 This graphic organizer assists students in interpreting information presented in an informational text and explaining how that information helps them to understand the text. 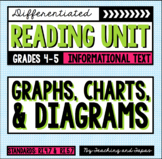 It is aligned with Common Core Standard Ri4.7. 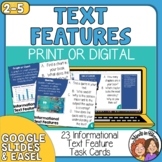 Using the text feature or graphic source shown, students must answer the question and then create one question that can be answered by looking at the graphic. 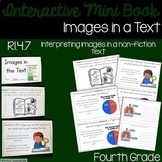 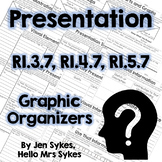 This graphic organizer allows students to interpret information by telling about the topic, how it is presented, and allows them to interpret to explain their understanding. 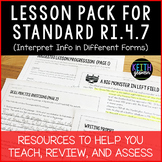 It is aligned with Common Core Standard Ri4.7. 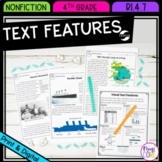 Use this text feature scavenger hunt to help students understand the importance of text features in nonfiction texts.